4. Hard/ Gas Permeable Lenses = 30 days per every 10 years of wear. Please Do not wear your contact lenses again after your pre-operative exam. Please do not wear eye make-up for 5 days prior to your pre-operative exam and 5 days before surgery. This is especially important if you wear waterproof eyeliner or mascara. Be sure to remove all liner and mascara and use a eye makeup remover if necessary. These should be done twice a day for at least one week before your pre-operative exam and again twice a day for at least a week before your surgery day. This will clear the oil producing glands in your eyelids of any debris blocking the expression of oil into the eye’s tear film. This oil is important to your comfort and healing process following surgery. This should be done twice a day for the week before your pre-operative exam and again twice a day, the week before your laser vision correction surgery. Place a wash cloth under the tap and rinse it thoroughly with hot water. Apply Ocusoft® or Sterilid® (one pump) to the wash cloth creating a lather. 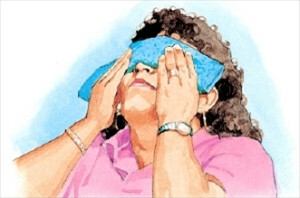 Gently close your eyes and apply the face towel to your eyelids. With a gentle side to side motion, scrub your eyelids and the margins of your eyelashes on both your upper and lower eyelids, thoroughly cleaning at the base of your eyelashes. Cleanse the upper and lower lid margins separately to ensure they are thoroughly clean. Perform the scrubs 2-3 minutes, two times daily for each eye. This will open the oil producing pores in your eyes and allow the oil they produce to be expressed into the eye. Place a wet wash cloth in a microwave for 10-30 seconds or use tap water as hot as possible but do not burn yourself! The washcloth should be warm but not hot or scalding when applied to the face. Lightly wring out the wash cloth so it is warm and moist then place it gently over closed eyes making sure the cloth is in contact with the base of your eyelashes or the lid margins. When the wash cloth is no longer warm, reheat and wring out the cloth and reapply immediately. Perform this therapy for 5-10 minutes, making sure to reheat the wash cloth 2-3 times. This assists the expression of oil produced in the eyes to be expressed into the eyes. Apply gentle pressure to lid margins, up and in for lower lids and down and in for the upper lids by placing your finger tips on the base of your lashes. Compress either the upper or lower lid completely before moving to the other eyelid. You will feel a mild tenderness as you compress, if done correctly. Look in the mirror while compressing. Use the white of your eye as a counter-force to apply pressure against. Press with fingers from one edge of the eyelid to the other, overlapping the areas where pressure is applied. Repeat procedure on upper and lower lid margins for 2 minutes.